We had a mixed show at Hartpury, but it started off very well on the first day with Becky winning the PSG riding Josie’s Don Angelo with a fantastc score of 72.37% against some extremely tough competition. Then Becky and Caluna went on to get a very respectable 70.31% and 3rd place in the Inter 11. Looking forward to competing Donald on the second day added to the huge disappointment when they found Donald in the stable with a swollen hind leg and bearly being able to put any weight on it. They immediately got the Hartpury vet on site to have a look and see if he could find out what could be wrong. It eventually came about that he could see a tiny plaiting needle head stuck in Donald’s frog which must have been dropped in the bed by a previous competitor. 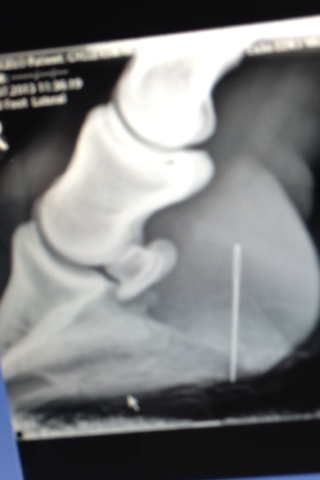 In order not to cause any possible further damage it was decided to xray the foot and see where exactly the needle had buried itself. Luckily (if you look at it that way!) the needle had gone straight up and slightly back missing any vital tendons, ligaments and burseries. The vet was able to pull the needle straight out and treat the foot very carefully not allowing any bacteria to get into the frog as this could be fatal. It was poulitced, cleaned and bandaged for 2 weeks and Donald was given some seriously strong antibiotics to clear any possible infection he could have and luckily Donald is now returning to work and looking as amazing as ever! The moral of the story is, if you are ever aware of dropping anything dangerous in the stable and cannot find it, clear ALL the bedding out as it can cause serious or fatal harm to your horse or somebody elses. Plaiting needles stuck in horses feet is more common than you would think with our vet alone having dealt with 7 previous cases! The mood picked up slightly with Becky and Caluna taking part in the Grand Prix scoring 68.4% and 2nd place which is a wonderful result as Caluna is not the biggest, flashiest horse on the scene but can definately hold her own against them! Moving on from that Becky then travelled back down to Hartpury with her team of young horses – Carinsio, Eleanor and Eaimbry Eleonora. One of the first competitors in the huge 4 year old young horse class was Becky and Eleanor who ended up with a great score of 81.2% and 9th place – having only been out to 3 shows this was a super result! (She is on our horses for sale page if anyone is interested!) Towards the middle of the class Becky then competed Eaimbry Eleonora, again a mistake free test and impeccable behaviour to get them 6th place and 82.4% – an exciting future is ahead for both these lovely mares. Next Post Jack Rules @ Regionals!